Sno-Paws® Pet Friendly Ice Melt is significantly less irritating than chloride-based ice melt. 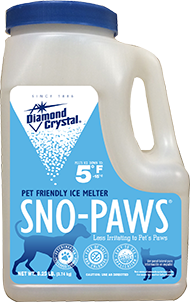 Diamond Crystal® Sno-Paws® pet friendly ice melt is specially formulated to keep people and pets safer. Its veterinarian preferred formula contains organic performance boosting chips to provide more melting at colder temperatures than urea alone. Sno-Paws® melts ice and snow at the same low temperature as salt while having none of the harsh chlorides that can irritate pets paws. Its green tint allows you to easily see the granules to make applying even easier. Directions: Remove slush and as much loose snow as possible before ice melt application. Spread Sno-Paws® ice melt evenly across surface area using ½ - 1 cup per square yard, depending on ice thickness and air temperature. When ice and snow softens, remove slush and any excess ice melt from pavement for good concrete maintenance.